The video shows the car, a mildly facelifted long-wheelbase Rover 75, being driven through a surreal vision of a British landscape. My interest was excited by the introduction, showing a Viking longship appearing out of a misty sea. 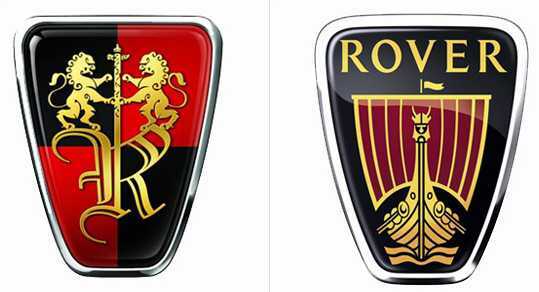 SAIC don't own the Rover name so the longship reference loses its point immediately. 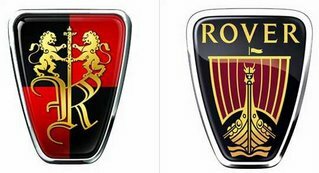 The badge adopted for "Roewe" is an Olde English capital 'R' in a cod-heraldic shield of the type one might find on a pompous idiot's personal letterhead, and which, ever so conveniently, fits the space left by the Rover badge. It could be that the video was made when SAIC believed that BMW would accept their offer, or is it possible that SAIC think that the Rover name will still come their way? Export plans are on hold for at least two years, so there's time for negotiation. If a Financial Times article of 18th November is to be believed the Viking Longship's berth at Solihull is but temporary, and it will soon weigh anchor for a long voyage east. I prefer to think better of Ford than to imagine that they paid BMW £6 milion for the Rover badge in order to sell it on for a quick buck, but there is some logic to selling it on once their legal people have protected any compound names, such as Trail-Rover, Track-Rover or even Street-Rover, which could be identified with Land-Rover. Solihull to Shanghai by way of the Grand Union Canal anybody?